Posted on Thursday, May 3rd, 2012 at 6:30 pm. Come join the Formosan Association for Public Affairs Young Professional Group (FAPA-YPG) to hone your leadership qualities for further dedication in community; reflect on your path for building your Taiwanese/ Taiwanese American identity. Moreover, network with individuals who are or will be community-oriented leaders in Taiwanese American or Taiwan related organizations. 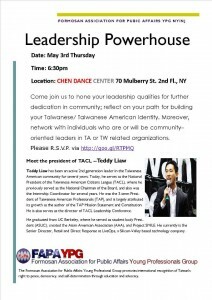 Teddy Liaw has been an active 2nd generation leader in the Taiwanese American community for several years. Today, he serves as the National President of the Taiwanese American Citizens League (TACL), where he previously served as the National Chairman of the Board, and also was the Internship Coordinator for several years. He was the 3-term President of Taiwanese American Professionals (TAP), and is largely attributed its growth as the author of the TAP Mission Statement and Constitution. He also serves as the director of the TACL Leadership Conference. He graduated from UC Berkeley, where he served as student body President (ASUC), created the Asian American Association (AAA), and Project SMILE. He currently is the Senior Director, Retail and Direct Response at LiveOps, a Silicon-Valley based technology company. The Formosan Association for Public Affairs Young Professional Group (FAPA-YPG) promotes international recognition of Taiwan’s right to peace, democracy, and self-determination through education and advocacy.